The bell is rung at the conclusion of the ceremony. 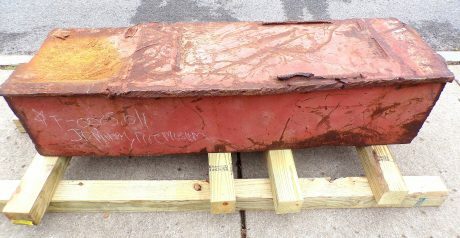 The Oswego Fire Department has a piece of a steel beam from the World Trade Center. It was on display at Tuesday’s memorial. 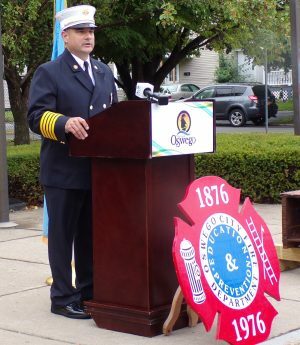 OSWEGO – Representatives of the Oswego Fire and Police departments, the Coast Guard and other first responders gathers Tuesday for a solemn memorial at the Fire Department’s headquarters. On display near the podium was a chunk of a steel beam from the World Trade Center – a grim reminder of the Port City’s connection to the September 11, 2001, terrorist attack. 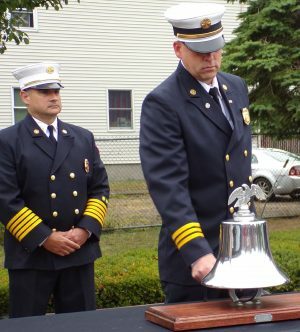 “Although difficult to conceive even today, yet even harder to watch play out at the time, what came from that tragedy should not be lost,” Fire Chief Randy Griffin told the large crowd of officers, firefighters and many other others. About a block south, two flag bearers stood at the edge of East Park displaying a large flag and a remembrance sign. 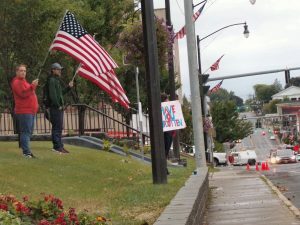 Occasionally, the remarks at the fire station were blotted out by the sounds of motorists blowing their horns in support. 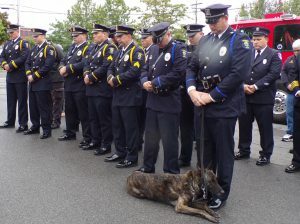 Approximately 343 firefighters, 60 police officers were among the victims that day, he added. 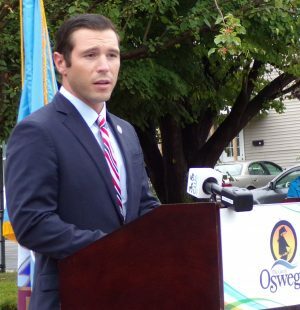 It is an honor to re[resent the people of Oswego – including the members of the police and fire departments – each and every day, because they are among the finest members of our community; “the heroes of our local community,” the mayor said. A moment of silence in memory of the victims. The first responders wake up every day and don’t know what might come their way, and their families have to live with that same sense of anxiety, he said. September 11, 2001, was one of the days that people remember where they were and what they were doing when they heard the new. Mayor Billy Barlow shares his memory of September 11 (and 12) 2001. The mayor was in the sixth grade at the time and remembers a teacher coming into his class and telling his teacher what was going and his teacher informed the class. The mayor said he still feels that same sense of pride and patriotism and be fortunate enough to live in America. 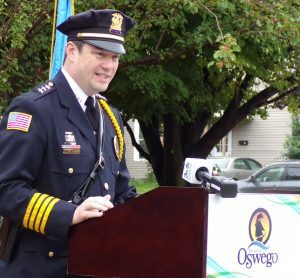 September 11 is more than just a date on the calendar, OPD Chief Tory DeCarie said. In the hours after the attack, the world was trying to process what happened. “We began to equate September 11 with words like ‘evil’ and ‘tragedy,’” he said. A bell was rung to mark the end of shift and honors those who died responding to the attack. Rev. Brice Schrader offered prayers at the ceremony. The day started bright and early.